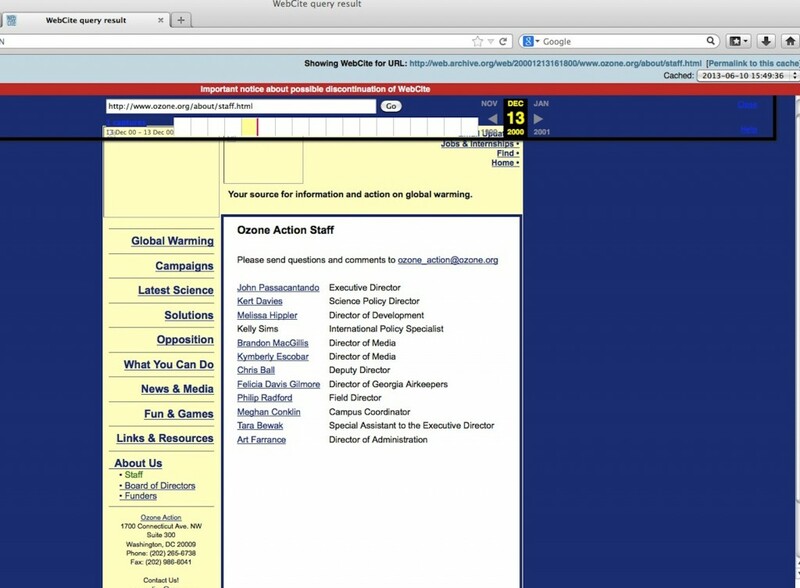 Greenwire’s old dawn-of-the-internet age June 20, 1991 electronically shared news brief, which could not be easily found by the general public …. has been found. Now, let’s see what’s in it. Knowledge is power, networking is priceless. 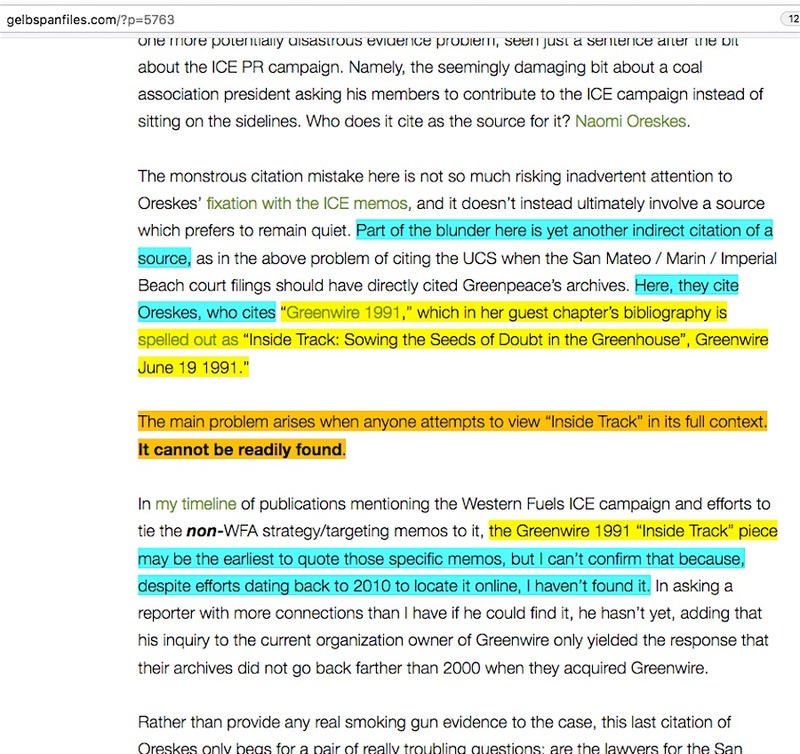 The reporter I noted in the above screencapture link from my October 2017 dissection of the San Mateo-Marin Counties / City of Imperial Beach v. Chevron cases contacted someone who had access to the “Lexis Advance and Nexis databases,” and now the full text of the Greenwire brief (barely over two pages) is here in PDF form. I’ve added some notes in the side margin. 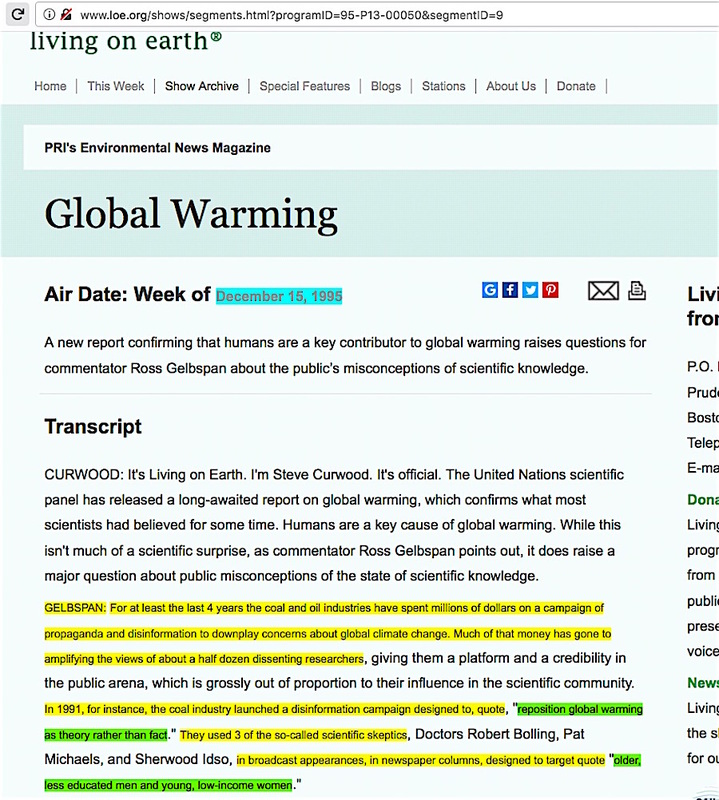 This set of so-called “ICE memos,” as I’ve repeatedly emphasized throughout my GelbspanFiles blog, are worthless as evidence to prove an industry-skeptic climate scientist misinformation conspiracy exists. The ICE public relations campaign was not the sinister industry effort it was portrayed to be, and these ‘alleged’ ICE memos were never even part of the ICE campaign. 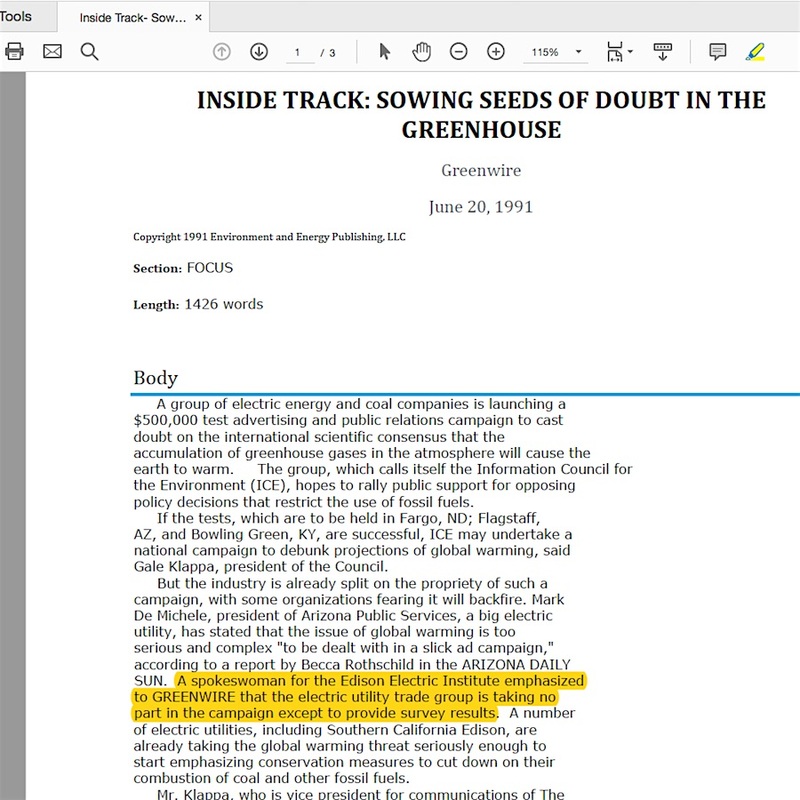 The June 20, 1991 date of this Greenwire brief is important because, as far as I can tell at the present time now, it is the first time any news media quoted those so-called “ICE memos.” Previous to this blog post, I could only say the first appearance of these memo quotes were in Mary O’Driscoll’s June 24, 1991 The Energy Daily article titled “Greenhouse ads target ‘low income’ women, ‘less educated’ men” (I don’t yet have a copy), which is corroborated by an Eco Geneva newsletter dated June 25, 1991 containing extracts from her article. 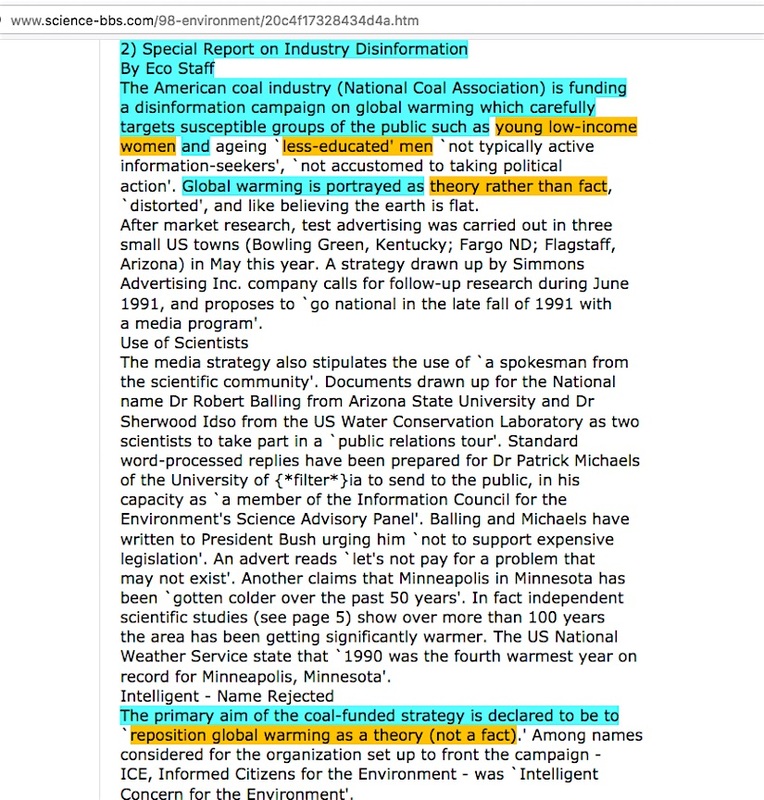 O’Driscoll’s article gives no credit to Greenwire for this information and doesn’t quote the “reposition global warming” strategy memo phrase, but notes instead that the targeting memo phrases were in “documents circulated around Washington D.C.” In the section prior to O’Driscoll’s article, the Eco Geneva newsletter does quote the strategy memo phrase, without saying where they saw the memos. Accusations based on faulty evidence don’t just materialize out of thin air; investigators will want to know exactly what the origins are and what the earliest participants knew about the ‘evidence’ and when they knew it. 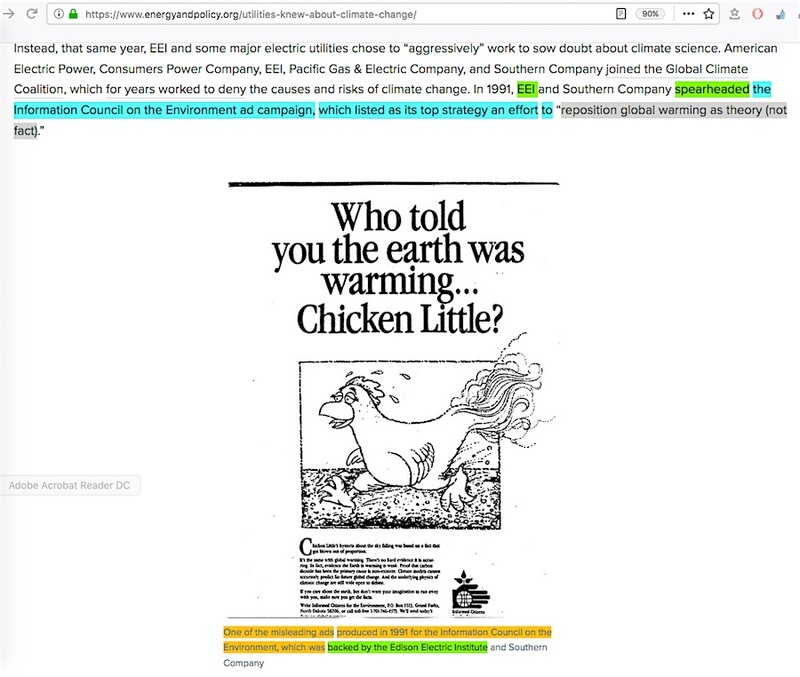 It’s plausible that Mary O’Driscoll merely repeated the targeting phrases from the Greenwire brief, along with potentially supplemental material accompanying the brief which might have described eco-groups who had copies of the memos. 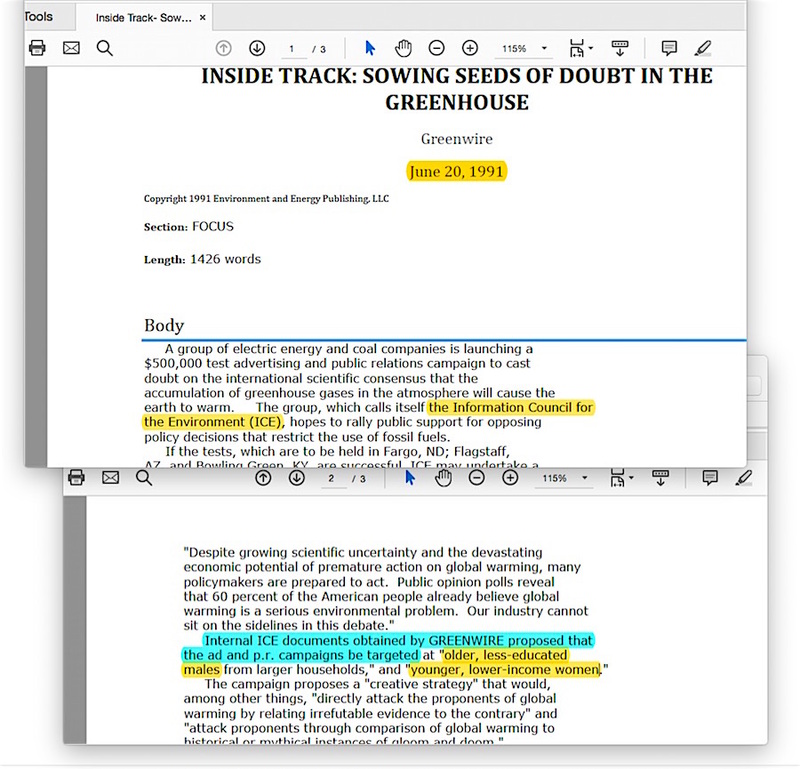 Considering the amount of additional detail the Eco Geneva staff quoted from the memo subset that was never part of the ICE campaign, they might have been one of the groups who were given leaked copies of the ‘complete ICE memo collection,’ and predictably ran on a conclusion which matched their ideological beliefs. 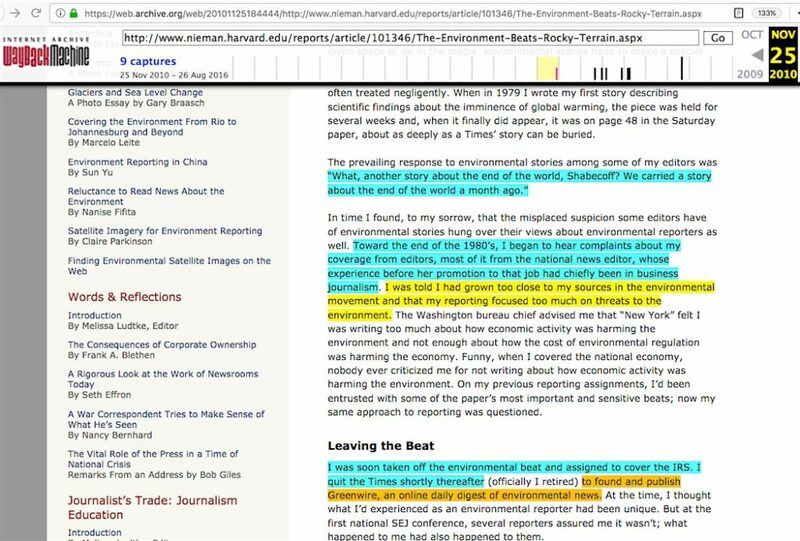 The critical question here is whether Greenwire – and its publisher, former NYT reporter Phil Shabecoff (described by NYT superiors as ‘growing too close to his environmental sources’) – undertook basic journalistic due diligence to see if the ‘leaked memo evidence’ actually was what it appeared to be. Besides that basic problem, there is another very large problem revealed in this Greenwire brief. 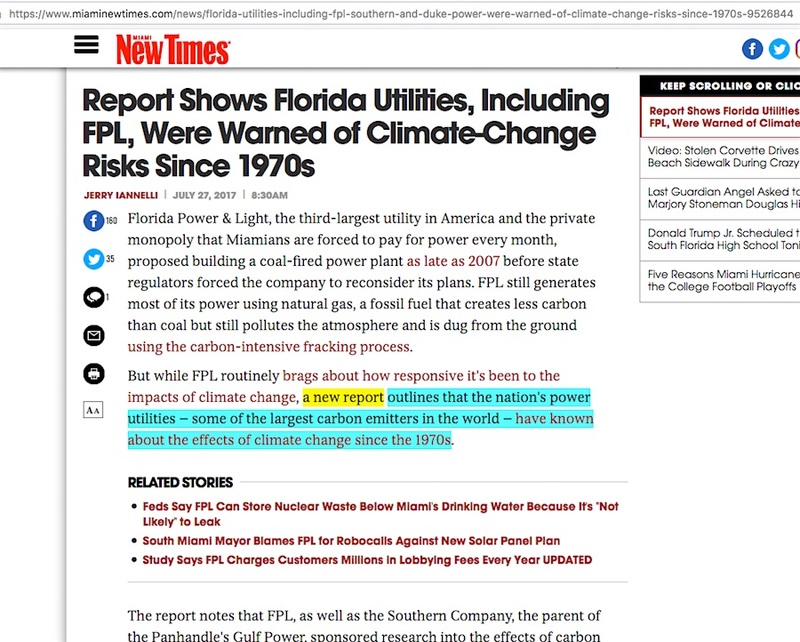 A spokeswoman for the Edison Electric Institute emphasized to GREENWIRE that the electric utility trade group is taking no part in the campaign except to provide survey results. No, it didn’t. 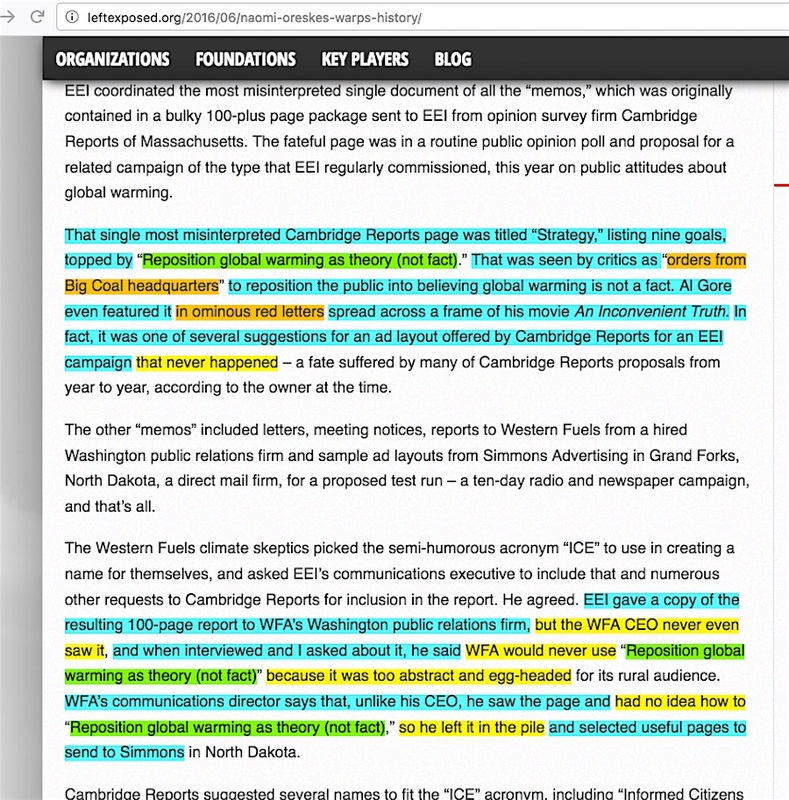 But where does the Energy and Policy Institute’s pair of clickable links in that passage lead to? 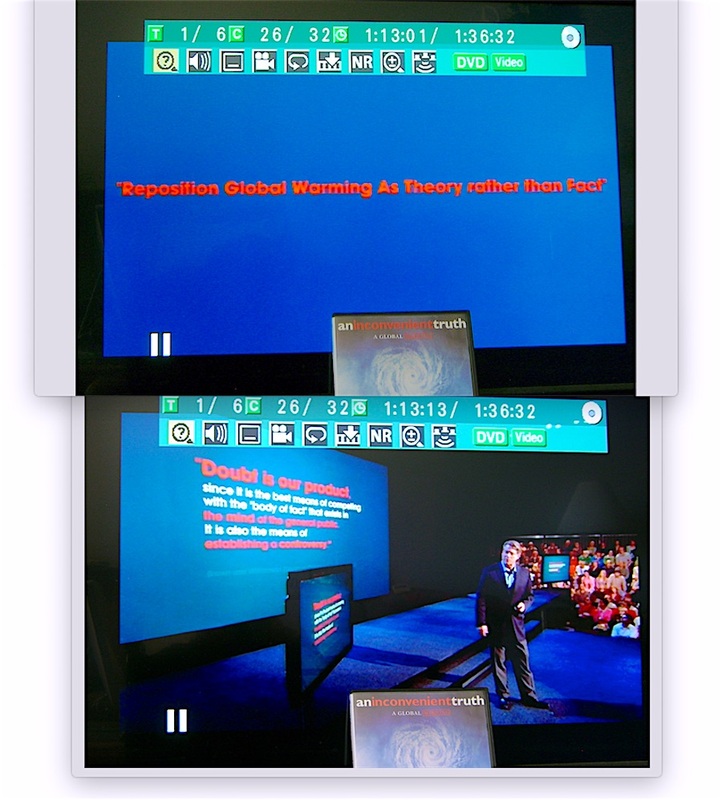 In a pointless repetition, both go to Kert Davies’ ClimateFiles ICE page. 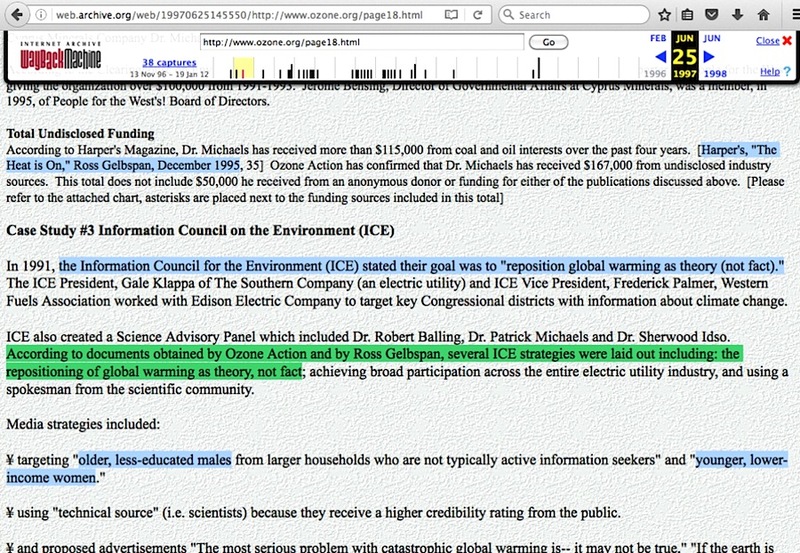 That Kert Davies, the person working at the old Ozone Action environmentalist group not long after the time when they mysteriously “obtained” the alleged ICE memos. 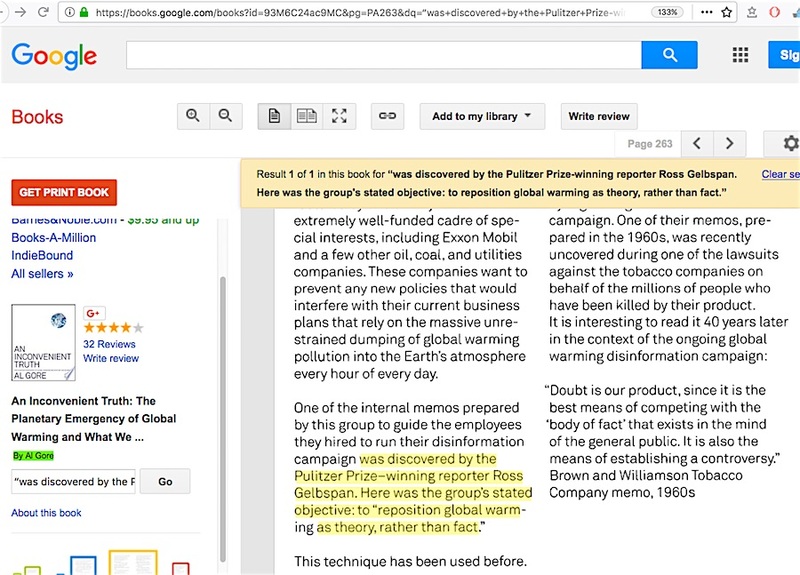 As Ron Arnold detailed in his June 2016 exposé about book author / documentary movie star Naomi Oreskes’ role in the ‘crooked skeptics’ accusation, the memo subset containing the “reposition global warming” / “older, less-educated males” / “younger, lower-income women” strategy/targeting memos was a part of a lengthy proposal submitted to the ICE campaign administrators that was rejected and never used. 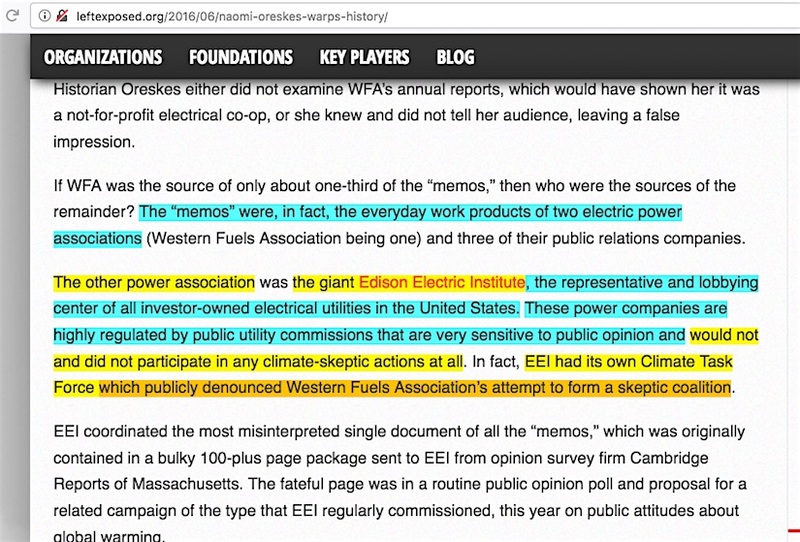 How could EEI “spearhead” a PR campaign that they actually denounced? 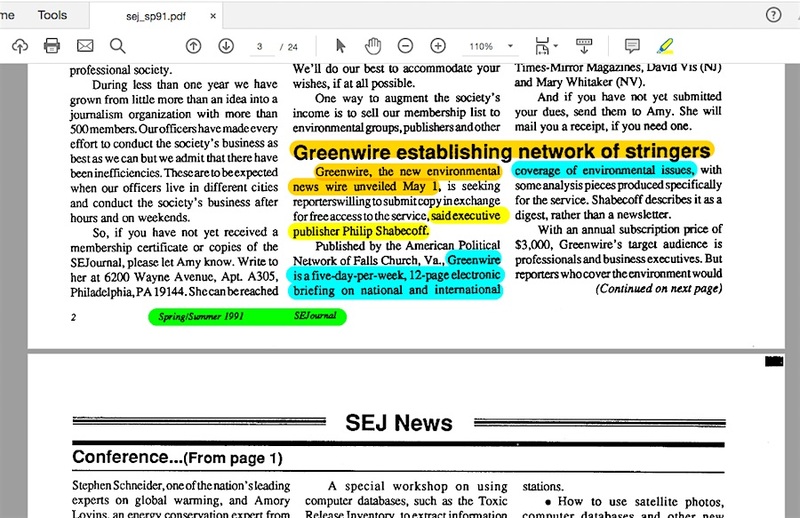 Oreskes is the person I credit for inadvertently alerting me to the existence of this otherwise very obscure Greenwire brief. The situation surrounding her connection to it along with other apparently outgrowth tie-ins to it are arguably the third major problem with it. 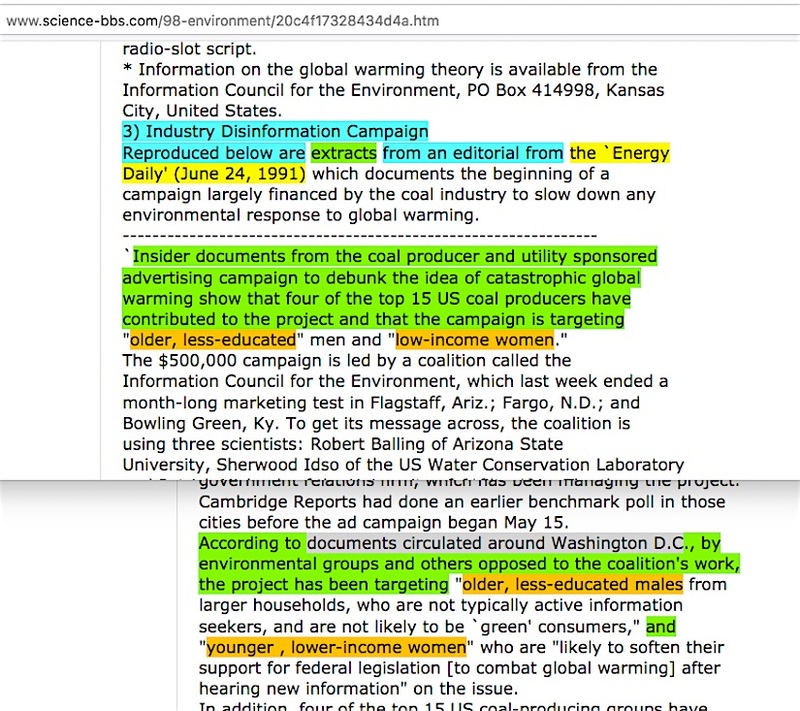 Part 2: the troubling connections to this Greenwire brief. 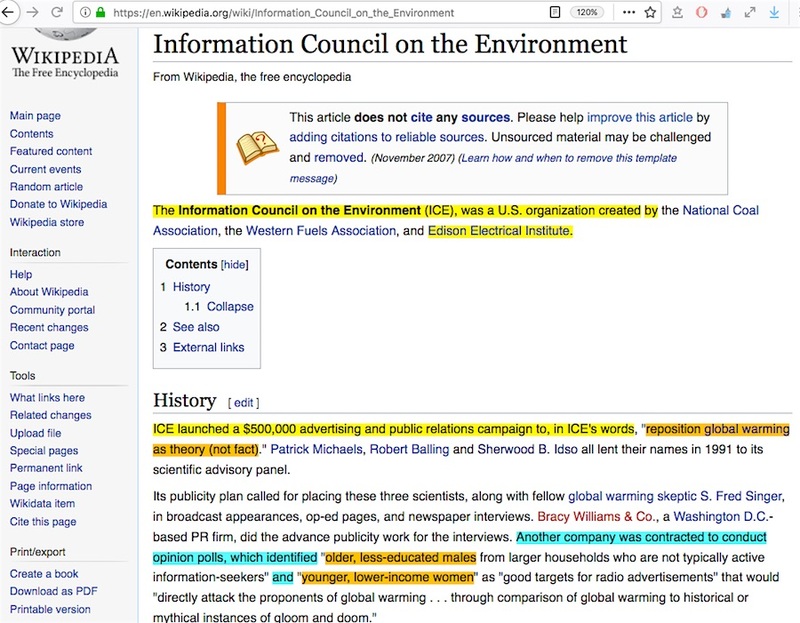 This entry was posted in Information Council for the Environment, Western Fuels Association and tagged Naomi Oreskes, Phil Shabecoff by Russell Cook. Bookmark the permalink.